I've recently started a new job and left the comforts of free lunch at my previous company. Yes. You read right. Free lunch! Every lunch time, lunch was practically brought to our desks to ensure we worked happier and ate together as a team (I think ALL companies should implement this FYI). After a year and a half of this luxury, I've become somewhat 'lunch lazy' and it's made me realise how much of a hassle lunch times really are, especially if you have a super busy job. Finding somewhere delicious to eat is a laborious process (*yawn Pret*), finding something which isn't package-wrapped and healthy is pretty much non existent. During one of my daily lunch struggle, right on cue, ping goes the F&L inbox with an interesting email from the lovely Toral Shah of The Urban Kitchen. We LOVE hearing about new food start-ups, there are just so many people out there working their asses off for massive companies, dreaming to kick off an amazing food venture. This dream and passion is what keeps people grafting through their 9-5 to save enough money and take the risk to go all out and start a business. Toral is one of those amazing ladies who bit the bullet and made her dream, her living. We read about Toral's story behind her business where she turned her many downs into ups, a story which is touching, yet inspiring. We won't rewrite what is already written, you can read about it here. 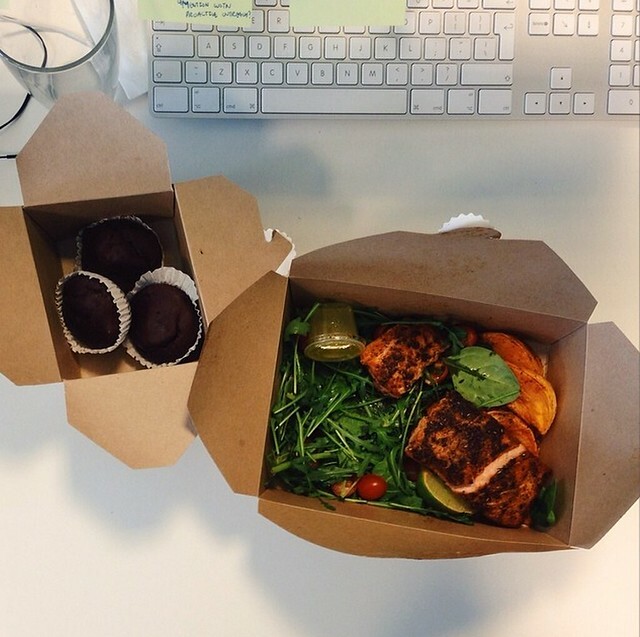 The Urban Kitchen is all about delivering freshly made, healthy and nutritionally balanced lunch meals straight from their kitchen to your desk. And, when we say it's delivered, best believe the food arrives hot and ready to eat! We opted for Blackened Salmon with Potato Wedges & Salad and Wild Boar with Pumpkin Wedges. We even got a side of Chocolate Protein cakes thrown in. 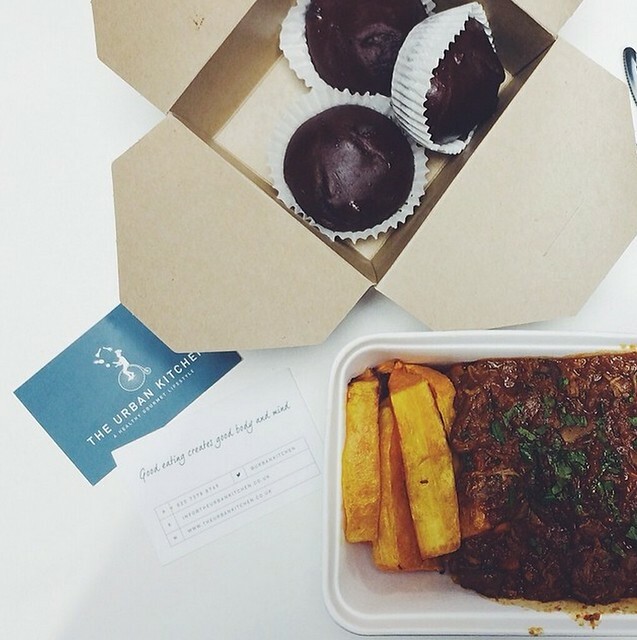 Our desk meals sure got a whole lot tastier! My salmon was cooked perfectly - slightly rare - and was seasoned with their secret spice, just enough so it didn't take away from the freshness of the fish. The wedges were SO BOOM! The Urban Kitchen aren't afraid to add a bit of extra spice to their food, which I appreciated. This is a perfectly balance meal fit for paleo-eaters and gym-bods (also fit for people like me who just likes the sound of Salmon+wedges together). The Wild Boar and Porcini Ragout with Pumpkin wedges is basically suited to anyone's dietry needs. Not only is this dish dairy free, gluten free and paleo-friendly, it is also low in carbs. And, it tastes awesome too. Although this meal is hearty and generous in it's portion, it doesn't leave you with that horrid post-lunch stodgy feeling or sleepiness. These lunch choices aren't what you would usually find on your high street, which is what we love about it. Granted, it is a little pricier than your bog-standard £5 baguette but it is so worth it if you want to treat yourself once a week. You can really taste the freshness of all the seasonal ingredients that are used in the dishes. Great food, and even greater people behind it. Check out The Urban Kitchen and be sure to read about their company philosophy.